/a> Key project proponents prepare to ceremoniously initiate the building of The Galaxie. (l to r) Festival Food CEO Mark Skogen, District Six Alder Marsha Rummel, WI DNR Administrator Patrick Stevens, former District Two Alder Bridget Maniaci, City of Madison Director of Planning, Community, and Economic Development Steven Cover, District Two Alder Ledell Zellers, Unidentified child, City Of Madison Mayor Paul Soglin, Gebhardt Development President Otto Gebhardt III, Architect Chris Gosch of Bark Design. In 2013, Gebhardt development won the chance to start from scratch and transform an entire downtown city block; but there were lots of requirements. The Tenney-Lapham and Marquette neighborhoods yearned for a full-service grocery store. The City of Madison has been clamboring to jump start redevelopment and create a gleaming gateway to downtown and developers have seen great potential for the area. 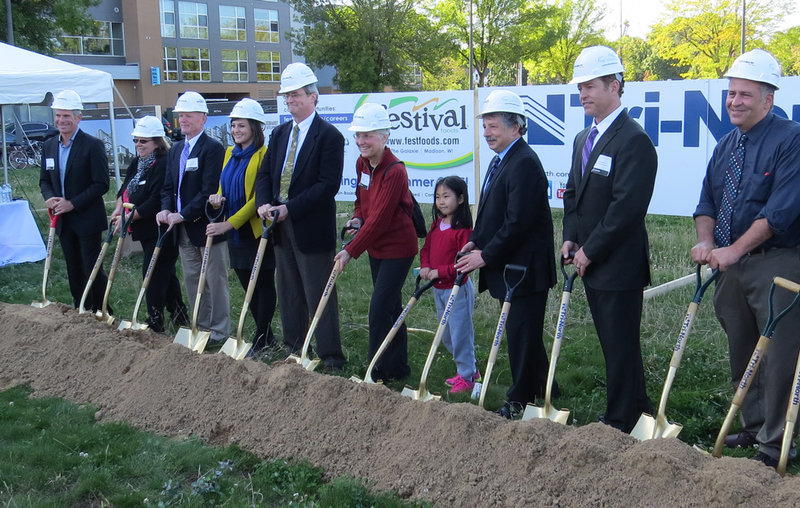 Tuesday’s groundbreaking event (September 16) marked the beginning of The Galaxie development that will remake the 800 block of East Washington Avenue. The gathering was infused with a heightened energy level because many of the participants that worked on the planning of the project felt that they had finally gotten it right. The iron tree sculpture that welcomes those traveling eastbound on Williamson to the neighborhood was dedicated Friday (September 12) in a ceremony at Bandung restaurant due to rain. 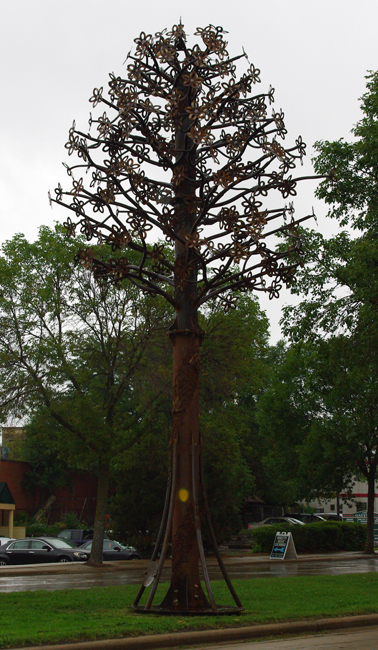 Named the CommuniTree, the 32-foot tall sculpture stands in the median of Willy street adjacent to Machinery Row and the Gateway Shopping Center. 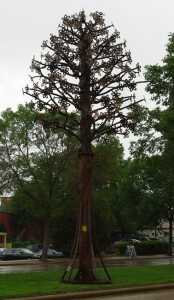 The tree was erected on August 3, garnering some praise and some comments of disdain; such as describing the tree as akin to a toilet brush, according to the Caffeinated Politics Blog. In the days before it was dedicated last Friday, someone or several painted a yellow dot on the side of the tree. The dot was likely meant to mimic the City of Madison’s method for identifying trees that need to be removed due to the Emerald Ash Borer. 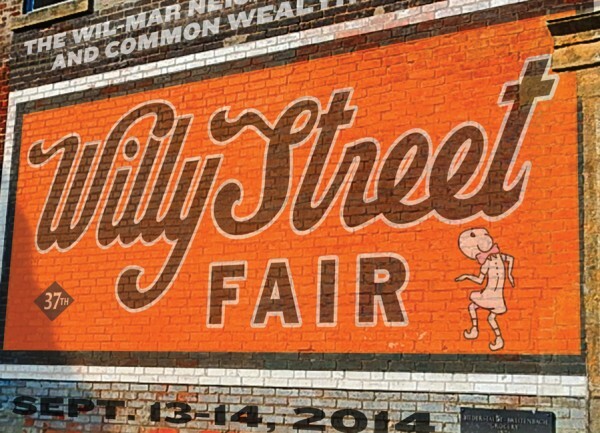 The Willy Street Fair, September 14, 2014. It was a cloudy start to Sunday but even Mother Nature sensed today was special and the sun emerged as the Willy Street Fair Parade prepared to launch. 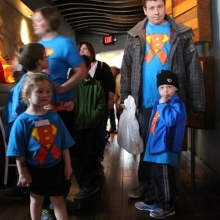 As it circled through the nine block route in the Marquette neighborhood, the phalanx of fun proved to be one of the largest by way of participants. Three marching bands at the beginning, middle and end, punctuated appearances by the familiar: stilt walkers, Hoopelation, the circus wheel and the Forward Marching Band; along with new entrants like the Madison Circus Space and the Mustache Beard Wearers Union: Local 608. Down on Willy Street the thoroughfare filled quickly as temperatures in the middle 60s and possibly a late-afternoon Green Bay Packer kickoff brought people out early. Over 150 vendors filled the curb spaces and the larger presence was notable. The food offerings were diverse and plentiful but the retail booths did not break much new ground. The final festival of the summer is here and just in time as fall stares at us all from off stage. The Willy Street Fair (September 13-14) is this weekend, heralding the end of a great season of celebrations within the neighborhood. For 37 years we have gathered along several blocks of Williamson to recognize many things; but mostly the spirit of neighborhood togetherness, action and culture. While the event is a fundraiser for both Common Wealth Development and the Wil-Mar Neighborhood Center, organizer Gary Kallas says the community aspect of the fair has always come first. 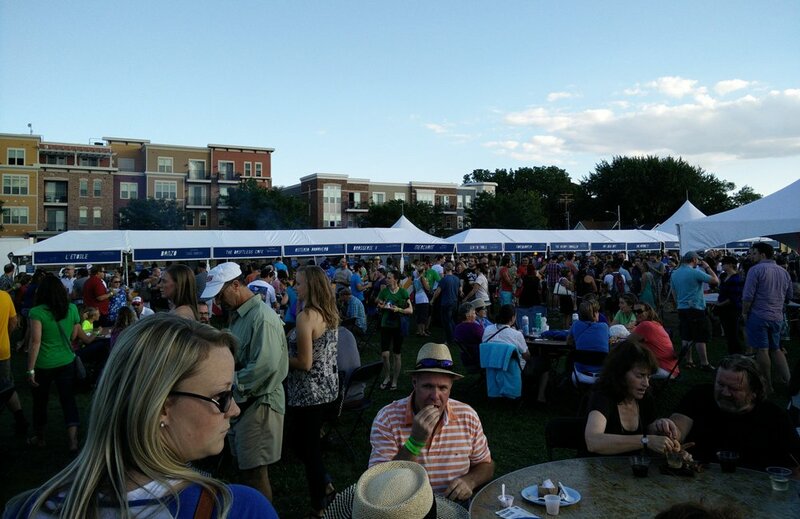 The first annual Yum Yum Fest held forth in the newly opened Central Park as members of the Madison Area Chefs Network offered their most creative dishes to attendees. 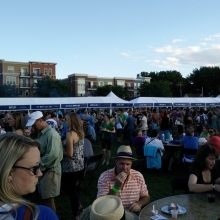 The event was created to highlight the strong connection many Madison restaurants have with local food vendors. Along with the food were four strong musical acts to entertain the throng on a glorious late summer Sunday afternoon. 1018 Williamson may be demolished and turned into greenspace. 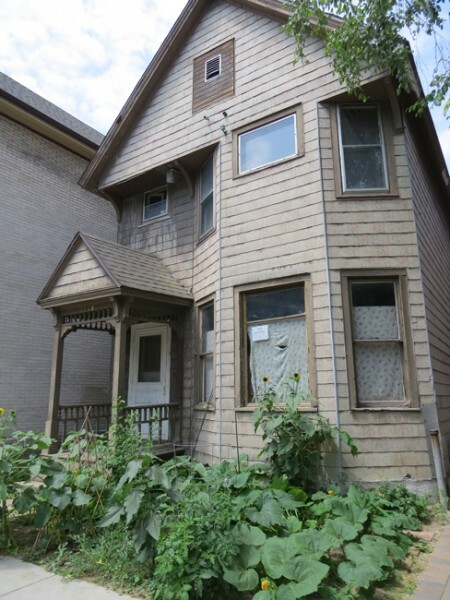 Petinary owner Dr. Mike Kohn has has applied for a demolition permit for 1018 Williamson Street, a circa 1895 home that has not been occupied since he purchased it in 1992. The application will be discussed at the Marquette Neighborhood Association Preservation & Development meeting Tuesday September 9 at 5:30 p.m. In the application, Jim Glueck, of Glueck Architects who represents Kohn, outlined several seemingly fatal flaws with the building that render it unusable an impractical for restoration. Glueck noted in the application and also confirmed to Willy Street Blog that the site will be restored to greenspace with no further plans to develop. 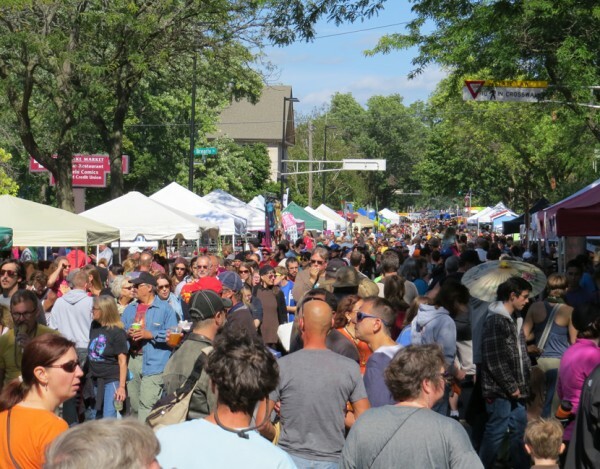 Some may think Madison is one of the snobbiest cities in the land, but there is one thing we won’t apologize for: the festivals. This city packs an incredible amount of these celebrations in our small window of temperature appropriate weather each year. 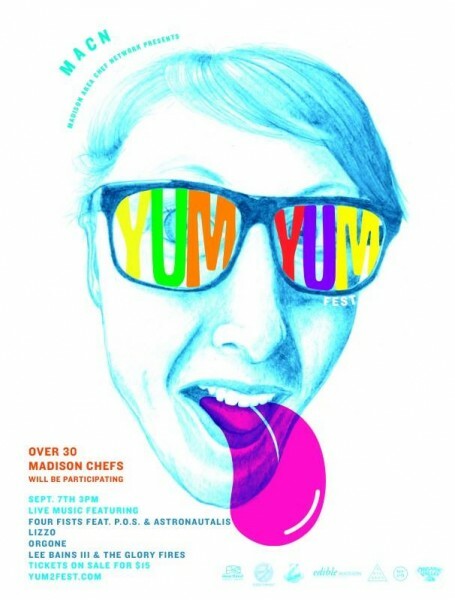 One more event has been added to the summer lineup with tomorrow’s Yum Yum Fest in Central Park. Created by the newly formed Madison Area Chefs Network; the festival will highlight the incredible, and nationally recognized, dining options that have emerged here in Madison and their kitchen leaders who have committed to sourcing much of their food locally. 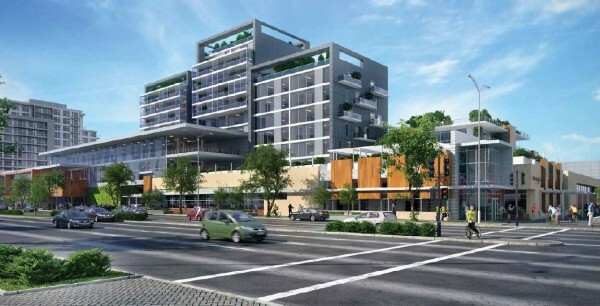 The next phase of progress in the Capital East District will begin ceremonially on September 16 as city leaders and developers will break ground on the $90 million Galaxie, a 14-story 670,000 square foot mixed-use development that will transform the 800 block on the north side of East Washington Avenue. It is almost a shame that this space will be disrupted since a lovely carpet of green grass has grown over the former Don Miller site following a soil remediation project. But it seems to be a worthwhile disruption as the new complex will address many of the goals of the City of Madison, the adjoining neighborhoods, and the growing demand for housing in the city core.